This, after winning the second round of their Caribbean Football Unionâs zone of the CONCACAF championships. It was an unusual occasion, for not often do national age group teams advance to the finals of regional football competitions. Thus far, the Vincentians have played unbeaten in their five matches. In the preliminary round held in Grenada in May, the Vincentians beat Guyana 2-1, the British Virgin Islands 23-1 and Grenada 1-0. Against St. Kitts and Nevis last week, St. Vincent and the Grenadines triumphed 1-0, thanks to a 56th minute goal by Cornelius Stewart, then held the host the Netherlands Antilles to a goalless tie, to finish on four points and top of Group G.
Stewart, also a member of this countryâs senior team, goal keeper Dwayne Sandy and Johlanshoy Mc Dowald were part of the Under-20 set up two years ago. But the Vincentians did so with an under strength team, as several of the regulars were left at home. It was a good feeling for team coach Kendale Mercury, who revealed that there was a problem of discipline in the unit. âUndoubtedly, there is good talent, but there is a problem of disciplineâ, Mercury told SEARCHLIGHT. However, Mercury thinks that this area of concern is diminishing, as the players are beginning to believe in themselves. âWith this success, they are realizing their worth and will definitely gain their respectâ, Mercury opined. Reflecting on the performance of the team in Curacao, Mercury thought that the players improved, and showed fight especially in the St. Kitts/ Nevis match. âWe came out in the second half really focussed after an erratic first half, and the guys were really firing, and that attitude gave us the goalâ, he added. Mercury thought that it was the level of fitness that saw them through against the host nation. âIt was our fitness, especially in the last fifteen minutes, that helped. We were the fittest team of the three teams and it showed the way we finished the matchesâ, the certified coach said. Mercury said that he and his assistant Alfred Blackman employed the more customary 4-4-2 system versus the Netherlands, as the host players were technically better, than their charges. âWe could not allow them the space at the back like when we played St. Kitts, when we used the 3-5-2â, said Mercury, who was last employed as the Assistant Coach with Jamaica Premier Division Club Village United. Mercury said that as a lead up to the next stage, he will be looking for additional goal keepers, and some âbig strikers and players who are willing to run the flanksâ. Stating that the doors are still open to all players who are eligible, Mercury said that those who did not make the last trip will be part of the training programme, which should have resumed last Tuesday. 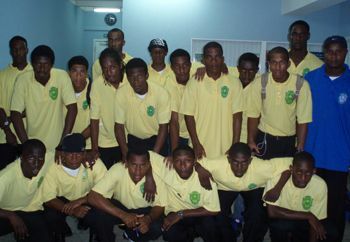 Prior to the Curacao trip, the Under-20 footballers were part of a two-week tour to the USA, where they engaged mainly university teams. Following their successes in Curacao, they were met at the ET Joshua Airport last Friday evening by President of the St. Vincent and the Grenadines Football Federation Joseph Delves, First Vice President Ian Sardine, and national senior team coach Roger Gurley. The young hopefuls await the outcomes of Group F, which involves the Dominican Republic, Haiti and Grenada, and Group H, which sees Aruba, Jamaica and Antigua and Barbuda competing.